In Morzine, in an area where food and drink plays a part in the art of living, sharing, especially over a meal, is a special time. It would almost be a crime to cut that time short with unnecessary scheduling. Here, the label of “Master Restaurateur” is rightfully at the table. It's time for an essential sneak peek in on the flavours of the earth, herbs, the tide and the forests. To the kitchen ? This is a label that puts freshness first and ensures everything is homemade. Even the gingerbread to go with the duck breast is made on-site here. That’s quite something. Rare too, the preserve of chefs and cooks, the alchemy of combining spices, savoury and bitter, sweet and sour. Time can still be made to invent a condiment, a simple afterthought to sign off a dish, although bringing a little extra soul and flavour to it. A dedicated, demanding and precise time, before the “shot” when flash frying and aromatic jus are juxtaposed with slowly developing flavours in the melting pot. In short, in the kitchen, creativity and time are bedfellows. Throughout the year, time makes and offers up its treasured flavours. No less necessary is the time to understand them, bring them out and put them together, with the hands and the heart. Breathing is an inspiration. Jean-Luc Theiller, the head chef at Le Petit Dru restaurant, Morzine, seeks out local charm and renewed tradition in the kitchen, creating a tasty offering that combines freshness, sensitivity, creativity and generosity. Many more superlatives could be laid on this passionate master of his art, whose vocation has played out over an incredible career. From catering school and a vital apprenticeship to gourmet restaurants, the pathway taken by this eternal learner from ‘doing’ to his now great skills has been peppered with landmark events. His taste for the mountains and new challenges eventually convinced him to cross France to take root in Morzine, where he has now been for over five years. At Le Petit Dru restaurant, the chef offers an inspired gourmet menu, a marriage of authentic flavours and bold bursts, of slow-cooking and unique tastes, all shaped by the seasons and creativity, at the summit. In the kitchen at Le Petit Dru, the team is indefatigable and the chef hots things up slightly nuttily. In the dining room, the team are an experience in themselves. 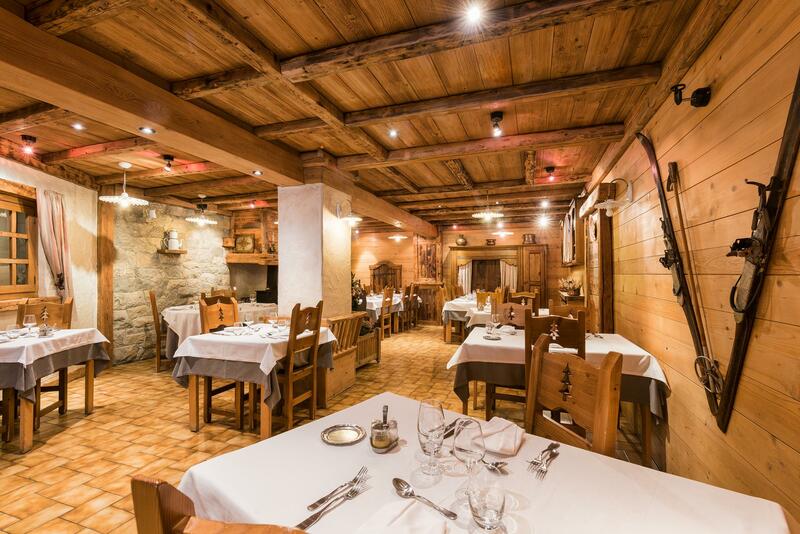 Then there are the craftspeople, the breeders and the local growers whose produce and genuine know-how play a part in the “come back again” nature and aroma of this Morzine restaurant, most unlike all the others. In the dining room as in the kitchen, simplicity and subtlety, inventiveness and seasonality are all combined, to the great pleasure of those who appreciate the good things in life. More than elsewhere, the maintenance, precision and fluidity with which each of them does their job are vital ingredients in the culinary dance we perform to satisfy every diner. Open to the passing hedonist as well as to hotel guests, the restaurant's dining room nevertheless maintains the intimacy of conversation. The crisp white tablecloths echo the authenticity of an address firmly anchored in the spirit of mountain chalets. Every detail, from the old skis hanging on the walls and the imposing fireplace to the wood panelling that creates a cosy atmosphere, is dedicated to a warm welcome, well-being and the generous seasonal local cuisine. Only the slight kookiness of the floral compositions acts as a prelude to a concerto of flavours. Guests are the privileged witnesses of the spirit that reigns in the kitchen and the virtuoso gestures of the chef. For each dish, he composes a symphony of flavours to delight the taste buds and take the senses on a journey. A signature dish, or a nature dish ? Although there is no dish of the day at Le Petit Dru, half board is available to hotel guests in winter. The menus pay further tribute to the variety of local produce. They make up a demanding score with a touch of improvisation and a note of whimsy, yet brilliantly explore the full range of the flavours of the moment. Of course, the restaurant is open to all comers who wish to discover the menu. A few words about the menu. It changes twice a year and is short, given the freshness of the produce. It includes the essential fish, as the chef loves to cook them, and creates a fusion of perfectly orchestrated options, all presented with sophistication. After all, we only eat with our eyes wide open.